What a privilege it was for me to be a part of the start of a very special weekend: Press Day at Hampton Court Flower Show. Watching the TV broadcasts from the Chelsea Flower show during May, it gave everyone a taste of what to expect at Hampton Court… or maybe not, but we were all about to find out. The day started very early with the drive to Hampton Court Flower Show, finding my way in and starting the long walk to see as many of the show gardens as possible. The garden designs and colours were outstanding to the eye and with so many wonderful things to look at, I did not know where to look first. Gardens have a strange way of drawing you in, whether it be by the shape of the garden, the colours used or the addition of seating, paths, statues and ornaments. 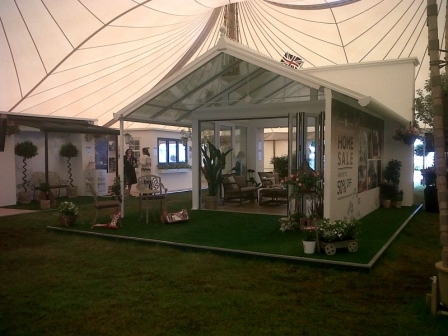 The first place that grabbed my attention was the Floral Marquee. The dazzling display of flowers, Bonsai trees and Evergreens were a feast to my eyes. 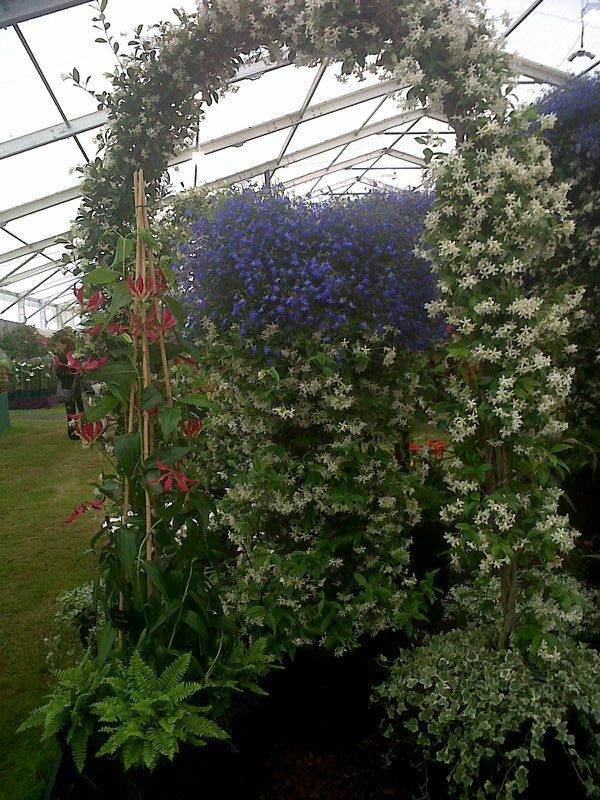 The marquee appeared never-ending, nurseries from all over the country had come together to proudly display their plants they have reared over the last few months, ensuring they’re in pristine condition for the big show. The blue Lobelia caught my eye, but the smell was an even bigger draw, much like the white flowers of Jasmin; it’s a shame you cannot bottle that scent right there and then. One garden that was very quirky at this year’s was the Summer Garden. The garden was saturated with green grasses, bursting subtly with purple, coral and burgundy and with some gorgeous, hand-painted backdrops overlooking the decked area it was easy to see why it was quite popular. The only thing missing was the Summer sunshine. 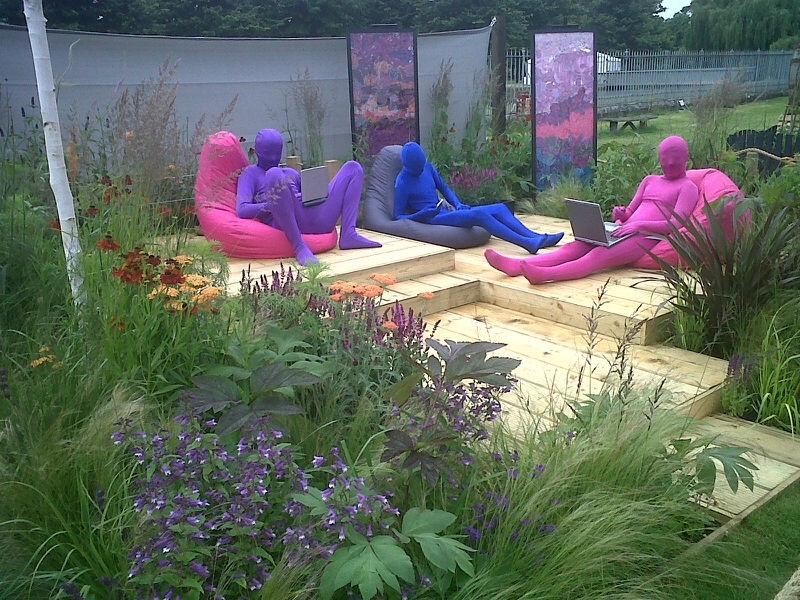 What immediately drew my attention to this garden was the people dressed in brightly coloured morph suits, sat on loud, pink beanbags – it was reminiscent of my student days, revising, socialising and being silly in the back garden. To my surprise I became quite critical in my own mind as to what I liked and did not like in the gardens. My overall thought was that the beauty of all the gardens was up to the individual. On the way around the show, I came across the Coastal Drift garden which had a real seaside feel about it. With big white walls creating the impression of space and the grass growing out of the top of the walls adding a factor of privacy, this garden was a very secretive, unique seaside garden area that I would have loved to have at home – there were no seagulls either! 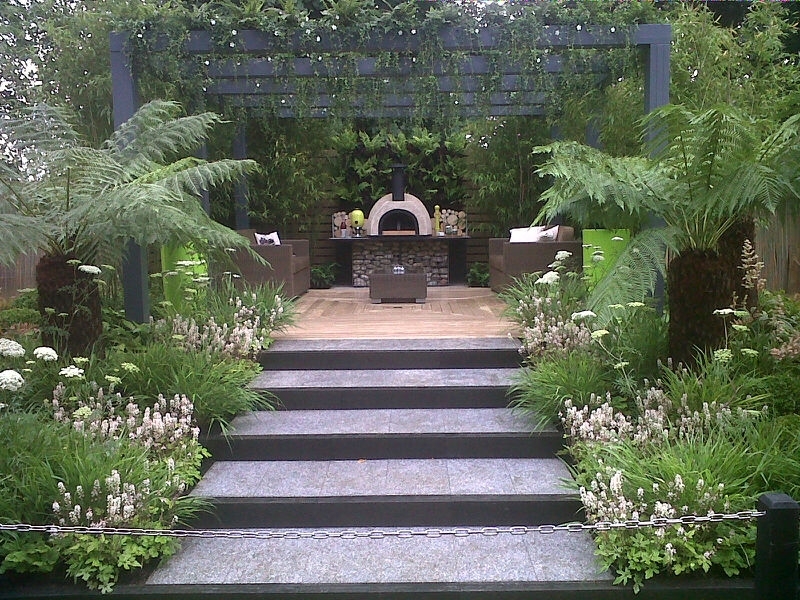 Live Outdoors was my favourite garden of this year’s Hampton Court Palace Flower show, winning a Silver Gilt award. I loved this garden because it was so calming and tropical, I felt like if this was my back garden I would hide away in it every weekend before returning to the hustle and bustle of the working week. The day whistled past so quickly, the judges had decided on the awards, the sun was getting lower and lower, my summer dress was calling me to leave and prepare for the Gala Evening. 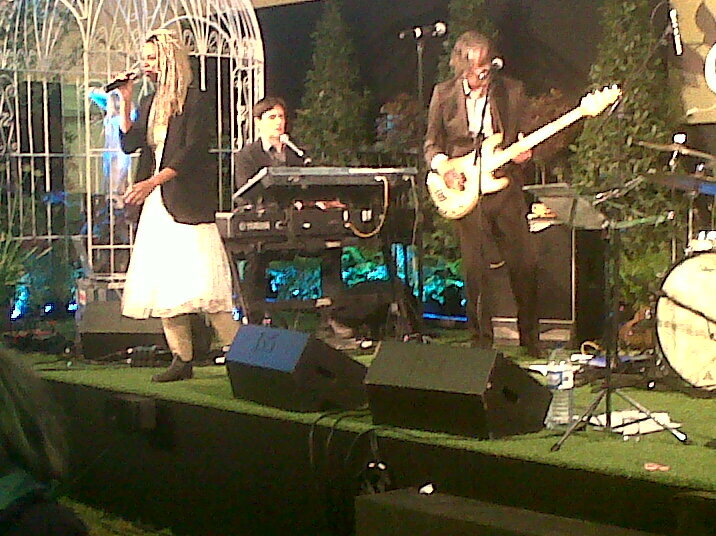 Well, what a fantastic night at Hampton Court! The gardens were teaming with inquisitive visitors and people with their picnics wanting to enjoy the evening, even though the weather was a bit temperamental. As the weather was determined to get everybody wet, the one place I knew I wanted to be this evening was the Grapevine Theatre, not just because it was going to keep me dry, but because of the displays and the band that would be performing later in the evening, The Satellites. I was impressed with the Anglian Conservatory Verandah, which had been furnished and styled by Laura Ashley helping give it a homely feel. Around the marquee were large TV’s enabling everyone to watch the band, the TV’s will be used during the show to show different gardens and what’s happening around the show. Once The Satellites started performing, the beat of the drum echoed throughout the gardens and enticed the crowd into the Grapevine Theatre to dance and sing-a-long to some classic songs by artists such as Robbie Williams and Prince. It persistently rained all night, but the crowd didn’t let it dampen their spirits as everyone made the most of the evening, dancing around in their raincoats and wellies.At 10pm the band finished, much to the disappointment to the crowd, but they finished with cheers and a round of applause. And then it was time for the fireworks. Every year, Hampton Court Palace Flower Show puts on an incredible display of fireworks to music, but unlike last year, the rain did discourage the audience from moving too far away from shelter. However, the fireworks display was spectacular, the vibrant colours bursting in the sky was like a mirror image of the gorgeous gardens below. Once the last firework had lost its spark, the crowd dispersed, all ready to rest their heads on their pillow after another incredible day at Hampton Court Palace Flower Show. For all of the workers and gardeners who are exhibiting at the show, it marked the end of day 1 of the Hampton Court Palace Flower Show. All will have woken up this morning eager to discuss with the new audience their wonderful garden designs and the audience will be just as eager to hear about it. One area of the show everybody who loves gardening should definitely visit is the Grapevine Theatre. 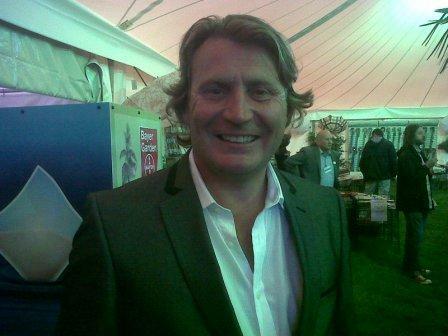 It is going to hold a week of presentations hosted by broadcaster and gardening expert David Domoney, who is currently co-hosting the ITV1 series Love Your Garden with Alan Titchmarsh. David and his team will be hosting a daily TV studio style show, where you can glean gardening tips and advice from the experts. The show will be displayed on large plasma screens inside the theatre, so any tiny detail that you can not see on the stage will appear on a screen not far from your seat. During the daily shows David will be joined by a number of celebrities who will share their gardening experiences – You can see them daily at 11.15am, 2.15pmand 5.15pm (3.45pm on Sunday only). If you would like to keep up with events at the show follow #HCgrapevine or #rhshampton, alternatively you could tweet us @anglianhome, we would love to hear what you are enjoying at the show.